This story was updated at 11:11 p.m. ET. The Unha-3 rocket lifted off North Korea's northwestern Sohae Satellite Launching Station at 7:39 a.m. local time Friday, April 13, according to South Korea's Yonhap News Agency. It was still late Thursday in the United States at the time. Officials with South Korea's Defense Ministry, which announced the launch, stated that the 90-ton rocket appeared to explode shortly after liftoff and break into 20 pieces before crashing into the international waters off the western South Korean coast, Yonhap reported. The rocket's flight path was expected to carry it on a southerly trajectory over the Yellow Sea just west of South Korea, then to the east of the Philippines. North Korea's state-run Korea Central News Agency did not release any announcements regarding the launch or its apparent failure. The Unha-3 rocket launch site is near the northwestern village of Tongchang-ri. North Korea announced its intent to launch the Unha-3 rocket in March, stating the goal was to loft an Earth-observing satellite called Kwangmyongsong-3 into orbit in celebration of the 100th anniversary of the birth of Kim Il Sung, the country's founder. North Korean officials insisted the launch was part of the nation's peaceful space program, but several nations, including the United States, South Korea and Japan, openly condemned the move, stating it was merely a disguise for testing missile technology. United Nations resolutions already prohibit North Korea from conducting ballistic missile tests. "Despite the failure of its attempted missile launch, North Korea's provocative action threatens regional security, violates international law and contravenes its own recent commitments," White House Press Secretary Jay Carney said in a statement. North Korea's Unha-3 rocket is a three-stage booster that stands about 100 feet tall (30 meters). Its launch comes after several space launch failures, including a similar satellite mission in April 2009. 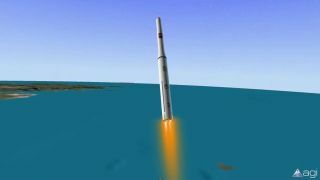 State officials claimed the 2009 event was a success, but U.S. intelligence showed that the vehicle failed during ascent and the rocket's second and third stages, plus the onboard satellite, plummeted into the Pacific Ocean. The launch of Unha-3 marks the third consecutive space launch failure for North Korea. In addition to the 2009 launch try, the country attempted to launch a small satellite in 1998, an effort that also ended in failure.